TAVARES, Florida – A sheriff’s department PSA about heroin overdoses in his county was questioned by some on social media over the weekend, because of the way some officers were dressed. 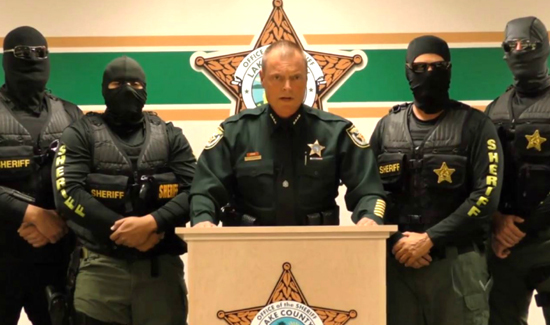 In the video, Sheriff Peyton C. Grinnell of Lake County, Florida, is surrounded by four officers wearing balaclavas (masks). Some are also wearing sunglasses, although the video was shot indoors. The officers seem to be undercover. At the end of the video, Grinnell warns drug dealers their days of freedom are numbered. After Grinnell delivers this last line, he and the other police officers file out. On Twitter, some said the video reminded them of threatening videos sent out by ISIS and other terrorist groups. @ArmyStrang tweeted: These cops look like they’re going to create a caliphate and behead moderate police officers. @RezOKC tweeted: An ISIS flag graphic in the upper-right corner would not look at all out of place in this video. I see nothing wrong here? Oh but wait the liberals don’t like this because they can’t pass out any meds or syringes to the trash the Sheriff is trying to kick out of his community!! It’s refreshing to see a real Sheriff wanting to be a lawman and not a political boot licker like usual. Keep up the good work guys & Stay Safe..
Really? I see plenty wrong with this video. The Sheriff did nothing that to gain my trust. All he did was present a cowboy attitude that he and his department has in regards to law enforcement. A recklessness that places his entire community at risk. This video is one of the reasons why SWAT or SRT should be severely restricted.